As we bring the holidays to a close, I have a book recommendation to help you frame your leadership perspective for the coming year. 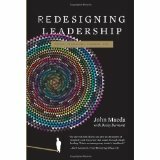 Redesigning Leadership is a short but insightful book that chronicles the leadership journey of Dr. John Maeda, world renowned designer and currently President of the prestigious Rhode Island School of Design. When I say “leadership journey”, I’m talking a very candid account of what Maeda did wrong on the way to doing things right. I found the nature of the narrative to be totally refreshing as it captured the well-intended mistakes that are a natural occurrence on the way to getting it right in leading people. I’d like to keep drilling down on the “journey” aspect of the book. Each vignette reveals a trial/error/retry/success pattern that accurately portrays how leadership is done in the real world. It’s a type of narrative that you likely won’t hear from those who have left the practice of leadership and spend their time doing commentary. It is frustrating at times when you read books, hear presentations, and start to feel inadequate because what you’re hearing comes off as totally intuitive and you wonder why you can’t get it right the first time/every time like they do. For a narrative that makes it clear leadership is about people and that through helping them be the very best they can be, organizations thrive…this narrative is for you. If you’re looking for a story that portrays the true iterative nature of leading people and that a servant spirit is what propels you past the cloudy days to get to the sunlight…this narrative is for you. The point is about the journey with people rather than prescriptive axioms that brief well but don’t reflect the way leadership is practiced in the real world. I encourage you to spend a couple of hours reading John Maeda’s leadership journey. You’ll learn something about having the right frame of mind to approach leadership, putting your ego in check so that you are focused on doing right more than being right, and how successful organizations are built around successful people. Invest in learning about leadership today and increase your capacity to achieve. It’s what a Critical Doer would…do!